Chester Village is delighted to welcome you to our long-term care facility. This new facility was designed to create a warm, relaxing homelike environment. "Where Life Has Meaning". Chester Village features a Village Shoppe and cafe, a beauty and barber shop, a place of worship, a family celebration room, deluxe couple’s suites, spacious private and shared accommodation rooms and a beautiful tranquil garden. 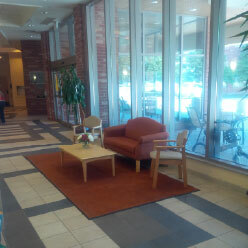 On each floor there are nursing stations, dining rooms, life enrichment lounges and activity rooms. Chester Village provides safe and secure accommodation for 203 residents and is conveniently located in an established community at Danforth and Warden Avenues.